In order to re-caulk your shower, you’ll need to remove the old caulk first. With a utility knife, slice through the old caulk along the walls, then scrape off as much as you can. After that, squirt some caulk remover on the remaining pieces to loosen them, then scrape them away as well. Make sure your caulked area is clean by removing any loose grout and cleaning up any mold. Next, use your masking tape to tape around the area you’re going to caulk. Start by taping off the corners of your shower, then tape the walls and the floor. Get your caulk ready by cutting the corner of the tube tip (at a 20-degree angle) to match the width of the gap you’re filling. Place the tube in the gun, then start at one end of your shower. When you use a caulk gun, our experts suggest holding the gun behind the line of caulk you’re producing and pushing the gun forward (so that there’s always a bead of caulk ahead of the nozzle). This ensures a deep fill and a good seal. It will make going around corners easier. Once you’ve finished filling in your caulk gap, wet your finger and run it along the new strip of caulk. This will help press it further down into the gap and will help seal it. While the caulk is still wet, gently remove the masking tape around your shower. 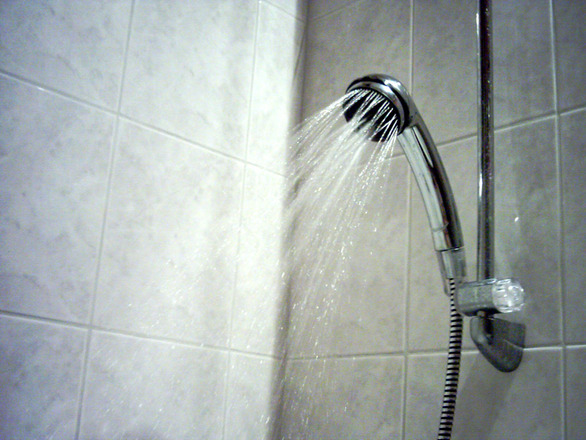 Let the caulk dry and cure before you use your shower again and when you do, it should be as good as new.